Who gets to be in the ‘collective’ of the university? With many thanks to Jules Gleeson for the excellent editing and feedback – this post is infinitely better for it. If you enjoyed this post and want to support a queer gender historian, consider subscribing to Jules’ Patreon here. NB: I write this as a disagreement, not as an attempt at silencing or a professional attack. Professor Selina Todd recently updated her statement on academic overwork. The main part of the piece is unobjectionable, one in a long line of pieces (including my own) on academia and overwork – my favourite of which is Liz Morrish’s recent piece on the ‘toxic university‘. Todd (rightly) encourages secure academics to fight the culture of overwork – as individuals and, ‘most important’ in her words, as a collective. Odd, then, that Todd has updated her call to solidarity with a postscript making it clear that, for her, the collective has firm boundaries that do not admit trans and non-binary people. She makes the tenuous link between academic overwork and ‘I began to question the whole premise that someone can transition [genders]’ by claiming that this is a vital issue of academic freedom. Todd cannot cite anyone who has told her to stop expressing these views (though I suppose she’ll cite this. Hi Selina!). She nevertheless claims that ‘this is about shutting women up’ and ‘the implication is that (…) I should not be allowed to express my views’. The implication of what? By whom? The closest thing Todd can cite to actual harassment is the case of Kathleen Stock, an academic at Sussex. Stock stated publicly that trans women were ‘males with male genitalia’, and as a result the University of Sussex student union issued a statement disagreeing with her and affirming support of their trans members and colleagues. Various responses were published – Talia Mae Bettcher’s and Aaron Jaffe’s make excellent reading, especially in engaging with Stock’s philosophical claims. Finally, the Vice-Chancellor of Sussex issued a statement supporting Stock’s right to free speech. This is the same Vice-Chancellor who vehemently opposed the UCU strikes against pension cuts earlier in 2018. Far from having been silenced, then, Stock is officially less controversial among Sussex University management than a defined-benefit pension. Condemning mere disagreement as ‘silencing’ seems somewhat at odds with Todd’s claim to ‘defend open, evidence-based debate’ and ‘freedom of speech’. Heck, people haven’t even disagreed with her yet, and she’s already put up a pre-emptive postscript. Peter Mitchell has written much better than I have on the ‘freedom of speech’ rhetoric and its use as a smokescreen for defending hateful views on race and empire in higher education. Mitchell notes that Professor Nigel Biggar “has preached about his persecution from the pulpit”, contrasting Biggar’s (and others’) claims of victimhood with the real danger faced by scholars and academics of colour. Todd also portrays herself as the victim of ‘shutting women up’, despite her senior position, public platform, and support from the very top of university management for the views she holds. As Sara Ahmed pointed out in 2015, ‘whenever people speak endlessly about being silenced, you not only have a performative contradiction; you are witnessing a mechanism of power’. I don’t want to draw firm parallels between this and racism – too often this is reduced to claims that a particular bigotry ‘wouldn’t be allowed if it were racism’, when in fact racism is alive and well in UK universities. Nevertheless, there’s an echo here of the claims, made by many white people, that calling them a racist is an oppression akin to racism (here’s a recent example). A particular example, which comes to mind because it, too, involved a senior academic claiming victimhood, is Mary Beard. In February, having tweeted that ‘it must be hard to sustain civilised values’ somewhere like Haiti, Beard reacted to the (justified) backlash by posting a photo of herself crying. As many pointed out, this is a use of the well-known ‘white tears’ tactic, (best elucidated by Mamta Modwani Accapadi in 2007 by which white women can claim helplessness and reposition themselves as the victim in any situation, even one in which they are oppressing a person/community of colour. Katie Goh skewers this tactic, and the complicity of those who use it, beautifully here – and it’s also worth reading Priyamvada Gopal’s rebuttal to Beard in full. In ‘An Affinity of Hammers’ (2016) Sara Ahmed also links transphobia and racism, as two types of ‘hammering’ by which trans people and people of colour, respectively, are unable to simply go about their lives without being continually required to account for themselves. Todd’s claim that she and Stock are victims echoes this tactic, positing the ‘debate’ as one between two equal sides, one of which (trans people, non-transphobic people) are trying to ‘silence’ their opponents by asserting their right to adequate recognition. Of course, neither Todd nor Stock are the real victims here. Stonewall reports that 45% of young trans people have attempted suicide – double the percentage (still far too high) of non-trans LGBQ young people – and that 84% of young trans people have self-harmed in some way. Over half of trans people have hidden their identity at work for fear of discrimination, and in higher education itself, 36% of trans students said they had faced negative comments from university staff. (Source: Stonewall). Parents at a school in Oklahoma declared ‘hunting season’ on a trangender student; anti-trans activists gloated over the shooting of an 11 year-old trans girl in 2017. This is not an even-sided argument. On the one hand, trans people face physical abuse and harassment, and discrimination at every level of society (from work to healthcare). On the other hand, two Russell Group university professors run the risk that a students’ union (which counts trans students among its members) might take issue with their claims that being trans isn’t real. Solidarity among women here requires that we acknowledge not only this oppression of trans people, but the link between the explicit violence and casual statements such as ‘I began to question the premise that someone can transition’. I’m cis, and even I have grasped how much of a struggle it is to be trans in everyday life, including academia, as Robin Craig points out (you can read his Twitter thread here). The idea that people ‘choose’ to be trans because of what Todd calls a ‘highly conservative’ attitude to gender identity is patently absurd – nobody is more acutely aware of the binding nature of gender stereotypes than a trans person who has, as the current law stands, to live as their identified gender for two years in order to qualify for legal recognition as their gender. Attempting to pass as your identified gender when trans, especially without medical support, is not only hard work, emotionally and physically, but dangerous. Assuming trans people undergo all this because they haven’t considered the possibility of a butch woman or a feminine man is both insulting and naïve. But it’s not really about conservative gender identity, is it? If you’d like to fight against conservative gender identity, attacking trans people will get you nowhere. Although we don’t have reliable data about trans people in the UK, the percentage of the population in the USA is 0.6% – approximately 13 times fewer than the 8% of British people who believe that women are biologically more suited to childcare, to give one example. It’s very specifically about the right of trans people, and specifically trans women, to be recognised as their gender – be that male, female or nonbinary. Todd has form in this area: she’s retweeted tweets which misgendered trans people and called for their removal from public events. 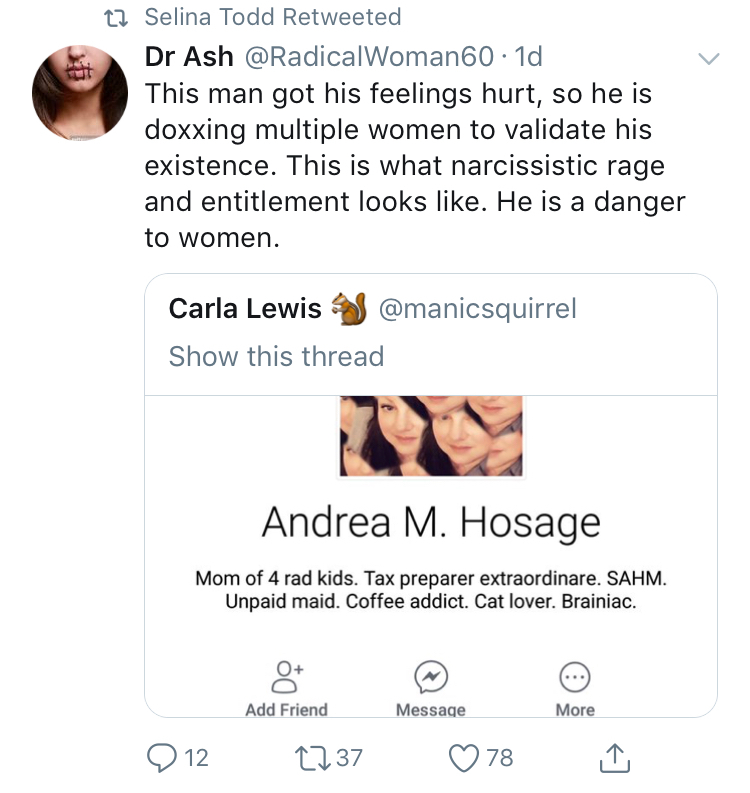 Selina Todd Retweeted – Dr Ash (@RadicalWoman60) – “This man got his feelings hurt, so he is doxxing multiple women to validate his existence. This is what narcissistic rage and entitlement looks like. He is a danger to women.” The ‘Man’ referred to is Andrea M. Hosage, a trans woman. 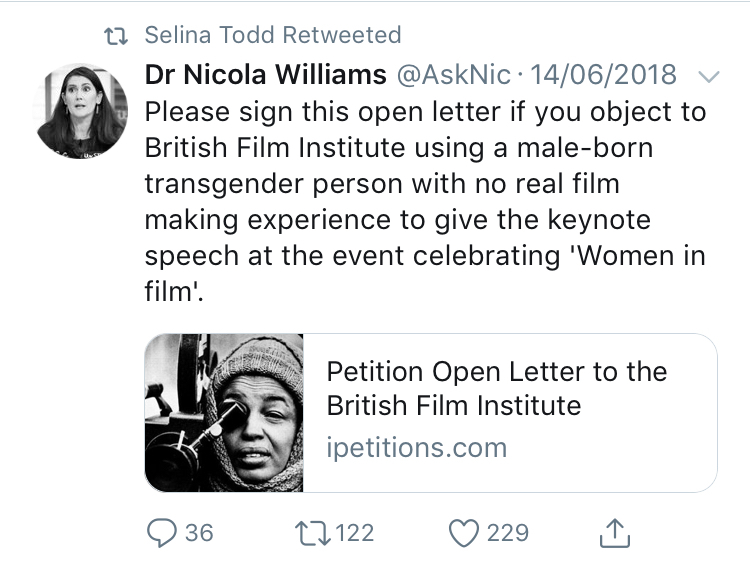 Selina Todd retweeted: Dr Nicola Williams (@AskNic): “Please sign this open letter if you object to British Film Institute using a male-born transgender person with no real film making experience to give the keynote speech at the event celebrating “Women in film”. Link to Petition: Open Letter to the British Film Institute. Todd notes that, as women (predominantly queer women, women of colour , and working class women, though she doesn’t mention this) get shouldered with more student support work, it’s more ‘professionally and personally hurtful’ to imply that students might not feel safe in their presence. The thing is: while I would not claim that trans students would be unsafe in Todd’s presence, or that she would harass them directly – I’m sure she’d teach them to the same standard she’d teach anyone – she’s not writing in a vacuum. Both of the tweets above not only misgender trans people but exposed them to (and legitimated) online abuse. Direct abuse or harassment of trans people is not distinct from denial of trans people’s gender, or their rights to live as that gender: it’s the other end of a spectrum. That spectrum starts with ‘Trans women aren’t real women as I see them’ and ends with the abuse detailed above. Even at the ‘lighter’ end, ‘mere’ discrimination has been shown to significantly affect not only trans people’s mental health (a recent paper showed that the distress coming from gender dysphoria was largely predicted not by the identity itself but by social attitudes towards it), but also their ability to seek healthcare. It would be not only understandable, but essential self-preservation, for trans students to avoid someone who didn’t believe they had the right to hold their gender identity. Nevertheless, and quite staggeringly, Todd believes that in this scenario she would be the victim of discrimination. Though the workforce of higher education is not nearly as diverse as it should be, it will inevitably contain a wide variety of people who experience a similarly wide variety of structural oppressions. This is not a zero-sum game. We can recognise both the oppression experienced by both cis and trans women, by straight, gay, bi, pan- and asexual people, by nonbinary people, by people of colour, by disabled people. And not only that – we have to. A functioning, diverse collective doesn’t require that we agree on everything, but it does require that we acknowledge and take seriously the experience of others – even, especially, if they are different to us. As Natalia Cecire points out, learning is vital, and violence makes for bad pedagogy: so if the collective of the university is to survive, its individual members must pay attention not just to our learning but to the violence we enact by exclusion and erasure. Who gets free speech in the university classroom? Opposing lecture capture is dis/ableist. Period.